After my disappointing experience at Krescendo, I was in the mood for a good pie. Donny met up with me at Toby’s Public House, a local bar that happens to make some pretty good pizzas. I hadn’t been there in a while, so I made sure to order my favorite of their pies. 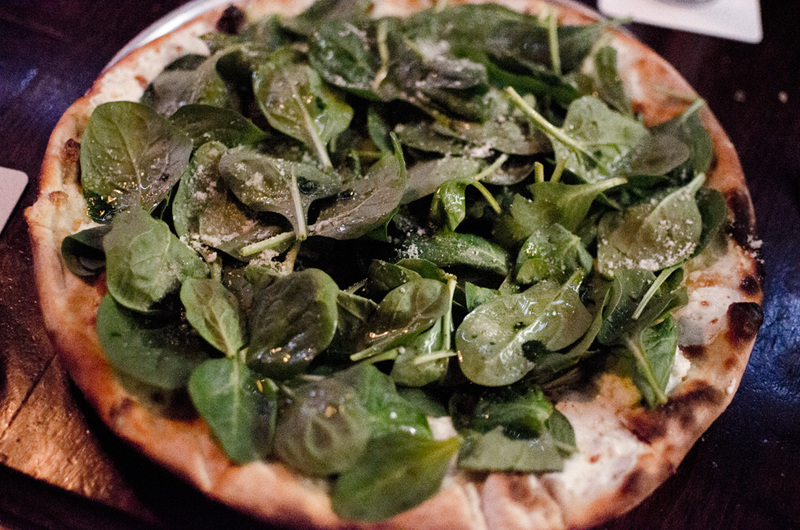 The Spinach is a white pie, topped with fresh spinach and truffle oil. A sprinkling of parmesan makes the whole thing work as a whole. Toby’s doesn’t make the greatest pizzas in the city, but for a local joint it’s pretty solid. They also have a full menu of non-pizza options, plus a nice beer selection. Altogether you get one of my favorite neighborhood spots. This entry was posted in greenwood and tagged greenwood, pizza, toby's. Bookmark the permalink. @molly – glad you liked it! most of their pizzas are really good, i also like the margherita.